Ever loved a poem so much you wanted to wear it? Join poet and Peach Mag editor in chief Rachelle Toarmino for a workshop exploring the relationship between what we say and what we wear. 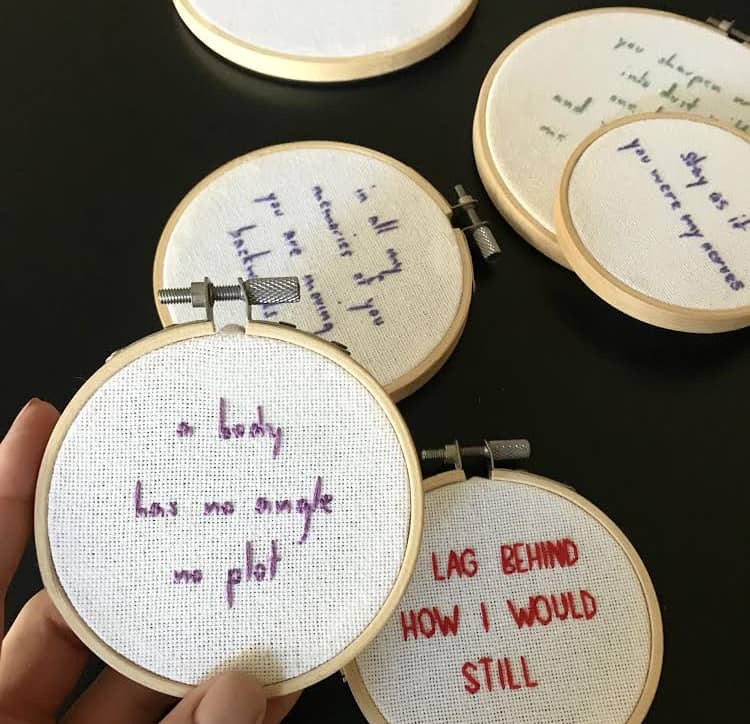 Participants will learn about the history of embroidery as a woman’s art of resistance alongside the contemporary ways we wear words, and leave the final session with pieces of clothing showcasing their own workshopped and embroidered micro-poems. Rachelle Toarmino is the author of the chapbook series of paparazzi poems, Graphic (Ghost City Press), and the chapbook of embroidery poems, Personal & Generic (PressBoardPress). She is the cofounder and editor in chief of Peach Mag, where she is currently at work editing With You: An Anthology of Withdrawn Poetry, a collection of poems that have been re-homed from predatory presses and journals in response to the Me Too movement.